I had to succumb to these embarrassing–and out of the ordinary–moments again and again to train myself how to manipulate my brain. Let me explain: while struggling endlessly to solve the equation, I found my own way to escape the stress of the problem by taking imaginary “trips to the moon.” I transformed the negative energy of stress into a more constructive time to entertain my creative process. I realized with time, only under pressure can we create diamonds. My stubbornness to believe in my own abilities led me to a yellow brick road that paved a way for all those I encountered to take the stage and perform their own illusion. And this, with Movmnt, is my greatest privilege to give visibility to those that believe enough in themselves to be, live, and create. 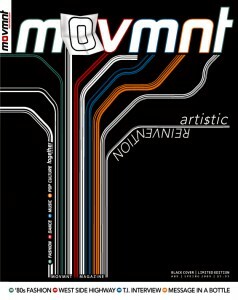 Travis Wall as featured in Movmnt Magazine Issue 8 – Photo concept by Travis Wall. 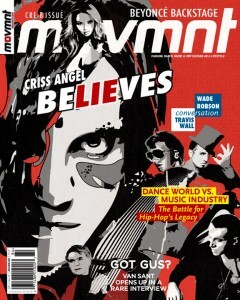 As a contributing artist with Movmnt, Travis posed himself as “The whole package” and interviewed fellow choreographer Wade Robson for our cover story.